Howe continues with the origins of empathy in aesthetics and the approach to the communicability of affect and feeling in art and beautiful nature. Aesthetic empathy provides access to experience from a first person point of view, and is not some separate approach different than what is experienced in relating to other persons. Likewise, rapidly sharing an emotional experience as exemplified by emotional contagion is not yet empathy but provides input to the empathic process. In applying empathy, one can be active or passive – actively imagining putting oneself in the other person’s shoes or literally being at the affect of the other person’s experiences as one is exposed to the other’s emotions and behavior. This corresponds to “top down” and “bottom up” empathy. 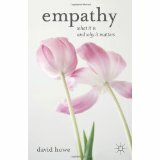 Howe explores the foundation of empathy in the Darwinian evolution of the human species. Cooperation, altruism, and community life require empathy. Howe asserts: “Evolution rewards the empathic” (p. 24). Howe engages early and often with the idea of “mind reading,” the ability to detect and grasp the intentions of other persons as “minded,” mentalizing creatures like oneself. In its cognitive aspects, empathy is about getting to know the other person. Howe notes that how children develop empathy includes joint attention. What is “joint attention”? While conventional wisdom says there is nothing new under the sun, “joint attention” may actually be something new. Not only does baby see the truck, baby sees that daddy sees the truck too. In other words, we – daddy and baby – are not cut-off and isolated in our minds. Such isolation was the fallacy committed by the philosopher Descartes, believing that he needed to prove something in the world existed outside his consciousness. We are already related to one another by attending to the attention of others. By the way, for all the intelligence of the great apes, joint attention seems to be lacking in the chimpanzees and gorillas. Apparently when one ape finds something really engaging, such as how to use a thin stick to scoop up termites, he does not turn around and show his colleagues, “Hey, look at this cool thing I did!” Other apes may witness and copying such an innovation, but it is not actively shared as child and care-taker do. Could this ability to share mental states such as joint attention lie at the basis of language acquisition and the resulting explosion of cooperation, creativity, culture, and empathy that makes the human species so engaging and problematic? The implied answer is “yes”. The chapter on the empathic brain is a nice intersection of quotations from David Hume (1739) who waxes eloquent about the minds of men being mirrors to one another and Adam Smith (1759) describing emotional contagion combined with the latest results of functional magnetic resonance imaging (fMRI) from Jean Decety’s lab. In a sense, human beings are neurons and we are neurons “all the way down.” But then the neurons start to generate meaning and relatedness and life in community as we know it. This is the “hard problem of consciousness.” How do we connect the dots between the neurons and the richness of the first person experience that we have as persons living our lives? No easy answers here. When the neurons stop functioning as designed, whether due to traumatic experiences or biological defects, the dominoes start falling once again and disorders of empathy such as autism spectrum disorders or sociopathy emerge. This is an area that has seen an explosion of scientific research over the past twenty years. Though we have a growing grasp of the neural correlates of consciousness and powerful psychotropic medications, it far from clear that any of them produce the kind of results enabled by the listening of an optimally response, empathic human being in conversation. Even as the existence of “mirror neurons” has gone from being controversial to being debunked (e.g., Hickok 2014), the existence and functioning of a neural circuit for empathy is a hypothesis with expanding scientific support. One of the strengths of Howe’s work is his depth of learning., combined with a light touch in presenting the material that makes it accessible. An original synthesis of existing ideas, he ranges between Baron-Cohen’s (2011) “zero degrees of empathy” in borderline personality disorder, Frans de Waal’s primate studies (2010) and Jean Decety’s fMRI work. Howe is a university level professor of social work, and he comes into his own in the applications of empathy to those persons suffering from issues that lead them to seek out psychotherapy and counseling. Three chapters (9-11) on client experiences, communication, and why empathy works form the heart of the psychodynamic aspects of Howe’s contribution. Howe is an advocate of the healing properties of empathy. It is not just that empathy allows the therapist to get inside the experience of the client so that he can give the experience back to the client in an interpretation that makes a difference. There is nothing wrong with interpretation as such, but it is not the complete story. Being the recipient of a gracious and generous listening, empathy, itself is a source of healing. Being “gotten” in one’s struggle and effort can cause a shift in the direction of opening up possibilities for moving beyond one’s stuckness in suffering. No doubt Carl Rogers (1951) is a significant influence on Howe’s synthesis. But I believe Howe moves beyond Roger’s mirroring and recognition, important though these are, to an “empathy cycle.” In such a cycle, the receptivity, understanding, and interpretation, of empathy are delivered to the client in an empathic responsiveness that tests whether the therapist “gets it” (in relation to the client) or not. Thought the devil is in the details, empathic responsiveness is why empathy works. The thing about social workers is that they are and remain social workers. In this case, that means that Howe comes down on the pro-social side of empathy. When all is said and done, empathy makes us better and should be promoted in child, adults, and community. It is not that anyone else ever thought that empathy made us worse as persons. That would be silly. Yet Heinz Kohut emphasized the aspect of empathy as a scientific form of data gathering about other persons that is value neutral and precisely ambiguous as to its social relevance. As Kohut famously said, empathy is “vicarious introspection,” in which one has a vicarious experience of the other’s feeling as if one were in the theatre or cinema. Thus, accordingly empathy could be mis-used as exemplified by the “empathic” Nazi who used it the better to control, dominate, and manipulate the would-be victims. Such misfirings and misuses or empathy remain a risk – and a point of debate – and presumably motivate the need for the explicit development of positive empathy in children, adults, and the community. This raises the question of whether empathy can be taught at all. Howe definitely advocates trying. My thought in this regards runs along lines sketched out by Carl Rogers about psychotherapy in general. With a few exceptions, people are naturally empathic and have to be inhibited, limited, and constrained. Much of education teaches compliance, rule following, and conformity, not necessarily cooperation and individualism. Therefore, the “training” in adults consists in removing the inhibitions towards openness and communication, allowing the empathic tendencies to resume their natural unfolding and development. Resistance to empathy may seem counter-intuitive, yet is pervasive and a source of resignation and cynicism. In the cases of children, presumably education should be attentive the ways empathy is inhibited and suppressed in order to produce conformity and compliance where the latter are not really needed. By all means, keep one’s hands to oneself and respect boundaries. But be open to empathy in navigating across the boundaries between self and other in a way consistent with integrity and completeness. Speaking personally as the author of three books on empathy, this is the book that I wish I had written. I hasten to add that my own works are excellent and everyone should read them, too, but Howe provides an accessible read is also rigorous and that will be relevant to a general audience. When all is said and done, when all the diagnostic categories are attached and philosophical arguments completed, in empathy, one is simply in the presence of another human being.